All electrical systems have the potential to go wrong, including electric blankets. fires, which can be devastating or even fatal. How safe is your electric blanket? 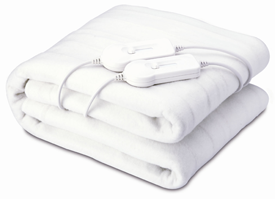 Electric blankets are perfectly safe to use provided they are in good condition and have the necessary overheating safeguards incorporated into the design. If your electric blanket has any of the following faults we recommend that you do not use it and replace it immediately. the elements are not loose within the blanket, touching or crossing over. Free electric blanket testing is offered over a two week period during October at different locations around the county. Always buy new blankets and not second hand. When fitting your under-blanket, ensure it is secured to the bed using the supplied safety ties. This will ensure that the blanket doesn’t move and damage the elements. When the blanket is not in use, store it flat or, if it must be folded, ensure that it is not folded too tightly. Don’t use a hot water bottle at the same time and never use the blanket if it is wet or damp.